Forget Amazon Prime Air drone delivery, how about Waterstones O.W.L.S.? Unperturbed by the shock news Amazon is plotting to use unmanned drones to deliver books and small items in 30 minutes, high street retailer Waterstones has come up with a similarly epochal scheme in response. The company has unveiled O.W.L.S. 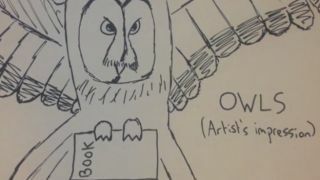 (Ornithological Waterstones Landing Service) - a delivery service that also pledges to get books to recipients within half-an-hour using the wisest of our winged allies. Waterstones doesn't know when it'll be rolling out O.W.L.S. because, as you can imagine, it takes ages and ages to train them and the company only just thought of the idea on Monday morning. Check out this Harry Potter-inspired idea in the video below. For some reason, we get the feeling Waterstones might be 'winging' this one.